Product prices and availability are accurate as of 2019-04-23 06:57:17 EDT and are subject to change. Any price and availability information displayed on http://www.amazon.com/ at the time of purchase will apply to the purchase of this product. lt;stronggt;AVTTLF2Blt;/stronggt;lt;BR/gt;Advantus Companion Portable File Storage Boxlt;BR/gt;See-through, hinged lid. 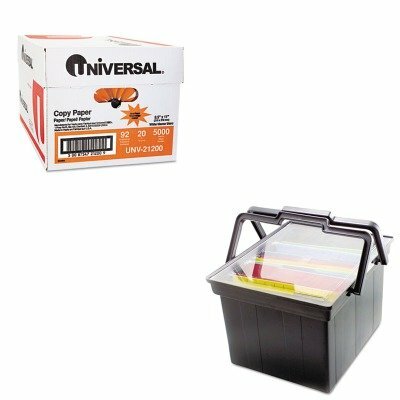 Includes easy-lift handles and built-in tracks for letter or legal size hanging file folders sold separately. Use file alone or set inside Heavy-Duty File Shuttle II AVT-FS-2BHD, sold separately for easy mobility. 40-lb. capacity. Plastic. Box Type: Portable Materials: Plastic.lt;BR/gt;lt;BR/gt;lt;stronggt;UNV21200lt;/stronggt;lt;BR/gt;Advantus Companion Portable File Storage Boxlt;BR/gt;For copiers. Great for everyday use. Acid-free for archival quality. This product was made from wood that came from a certified managed forest. Size: 8 1/2 x 11 Paper Colors: White Paper Weight: 20 lb Sheets Per Unit: 5,000.